We use the FLIR ThermaCam T400 Series. The best in Infared Camera System which produces razor-sharp images. Thermal Imaging Inspections are an accurate and reliable method of preventing equipment damage or catastrophic failure. 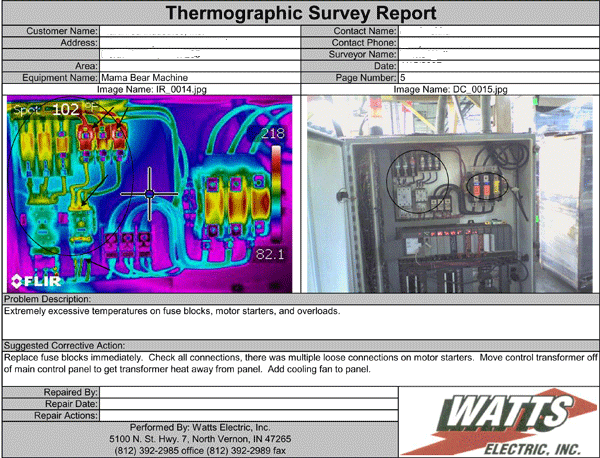 Inspection requires no downtime and can, in fact should, be done during normal operating conditions. A detailed report with photos and recommendations will be provided. We recommend that you check with your insurance provider, NFPA, manufacturer’s requirements, etc. for recommended inspection intervals. By investing in Thermal Imaging Inspections, you can reduce down time and costly repair expenses by finding potential problems before they turn catastrophic. See below for examples of potential problems.